Sometimes simple is best. No mess, no fuss, just stripped down to the bare essentials. This approach holds true when it comes to a simple landscape design. Whether you are looking to create a simple landscape design in terms of maintenance or cost, it does not have to mean scarce or unimpressive. Often time the beauty is found in the simplicity. 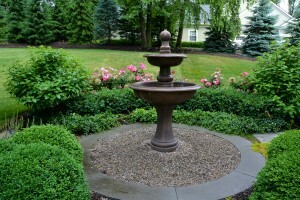 Many homeowners will gravitate towards a simple landscape design for their property. There are many ways to keep your property looking ‘simple’ – whether it is with a modern approach or just simply keeping the same color scheme throughout the yard. Given the existing aesthetic of your home architecture as well as property size, decide if a modern look is best or if you are looking for a more classic or naturalistic landscape. Whatever style best suits your home there are ways to achieve the look with the correct materials and specimens. Modern landscapes today work with clean lines, minimalist materials, cooler colors, and embrace the less is more motto. Though often times, modern landscape give off the simple landscape design feel, but do require a lot of maintenance in order to ensure the gardens are trimmed and growing properly and in unison with every season. For lower maintenance, naturalistic design, making small choices such as choosing a color scheme, is a way of incorporating a simple landscape design to your home. Small garden spaces on your property can keep a simplistic feel without becoming too cumbersome. Ornamental grasses are also great and can be free flowing in every season and will add a low maintenance, simple landscape design to your home. Focusing attention on an intimate garden state creates a simple and peaceful yard space to be admired. Small statutes are often popular in these simple gardens too, whether it is a bird bath or small fountain, creating a focal point helps draw the attention to this detail. Learning the sun patterns on your property is important in choosing the specimens you want to include in any simple landscape design. Knowing the proper shade, rainfall, sun exposure and soil conditions will determine where a garden should be placed and how much maintenance is needed weekly. Working with landscape professionals can help you to get the maximum potential out of your property.